Hello, if anyone is still bothering to read this! I'm majorly sleep deprived today. Lindsay is congested and was up at 3am coughing her head off. My poor hubby didn't get to bed til 2 so I tried to get up with her and let him sleep. (after we both played the up down game for half an hour). Did you know that it is IMPOSSIBLE to suction out a baby's nose in the middle of the night without waking them all the way the heck up!? I tried to avoid eye contact but when she smiles really big like "hey let's party since we're up" what are you gonna do??? After two attempts to rock her back to sleep (both times resulting in instant tears the moment her back hit the mattress) I gave in and we snuggled together in the "daddy chair" (comfy leather recliner) in the living room. By this time it was after 4 and my alarm went off at 5:15. Needless to say at 6:30 we awoke in a panic....I'm due in at work at 7. I'm blogging at the moment to try and stay awake. I promise to post some more pics by this weekend! I have some great ones on the camera. Thanks for your comments gals. Nice to meet you Katie. Your blog is a hoot and Joe is a cutie. I'm still new at this and having problems with my home computer. I am not sure if it's because I'm still on dial up (yes, it's true....as I hang my head) or if it's my actual computer giving me fits but the site refuses to load past the front page. I can't do anything from home which is MAJORLY aggravating. Dear hubby is going to get my computer checked out and may even get me a new pc on trade through someone he knows. We own a limo service and the guy he knows may trade me an upgraded used computer for some limo time! Gotta love it. Check out my hubby's company at www.maximumlimo.com for any of you that might want a nice ride one day! We're trying to figure out the issues and on top of that Bell South is screwing up our home line and hopefully soon we'll be getting high speed internet and digital cable! I could live without a house phone these days. We NEVER use it anyway. The only reason I think we should keep it is to be able to call 911 (you never know). I'm including on my post today a more recent picture of Lindsay. 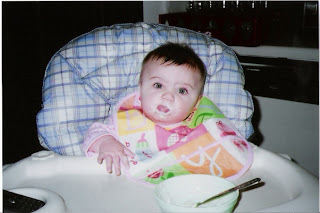 It's one of my favorites of her in her high chair eating rice cereal and fruit! What a face! This ranks up there for black mail photos when she's older! TGIF!!! I hope this blog inspires some of my friends to get out there and set up a page! Welcome to my blog! 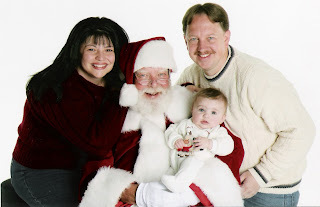 I thought I'd start with a family photo and I included our fave pic of Lindsay with Santa. These photos were taken in Nov 06 when Lindsay was five months old. 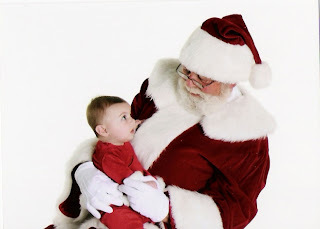 This is my tester post. Hopefully I can keep up with this so all of our family and friends can keep up with us! I'll catch up soon with some current photos and news. Enjoy!